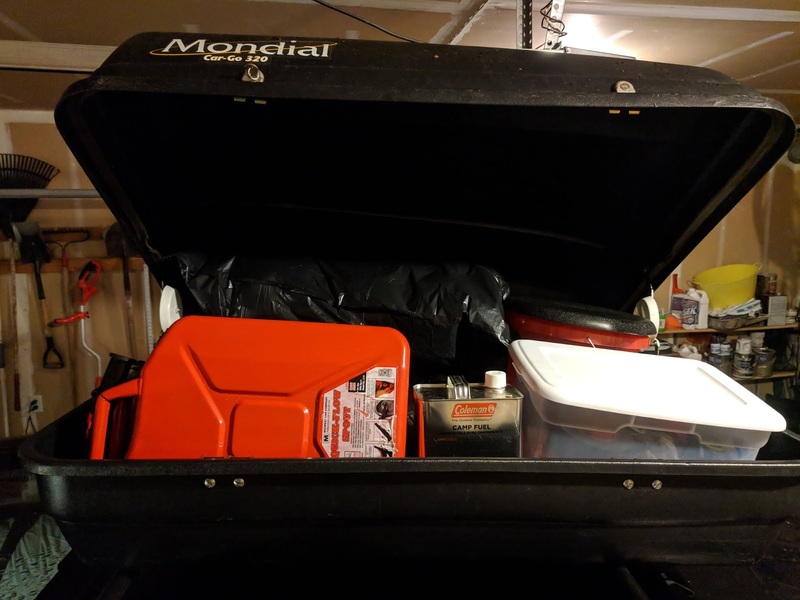 Little did we know, getting a small car ready for an extended road trip with almost no motel stops is a real chore. 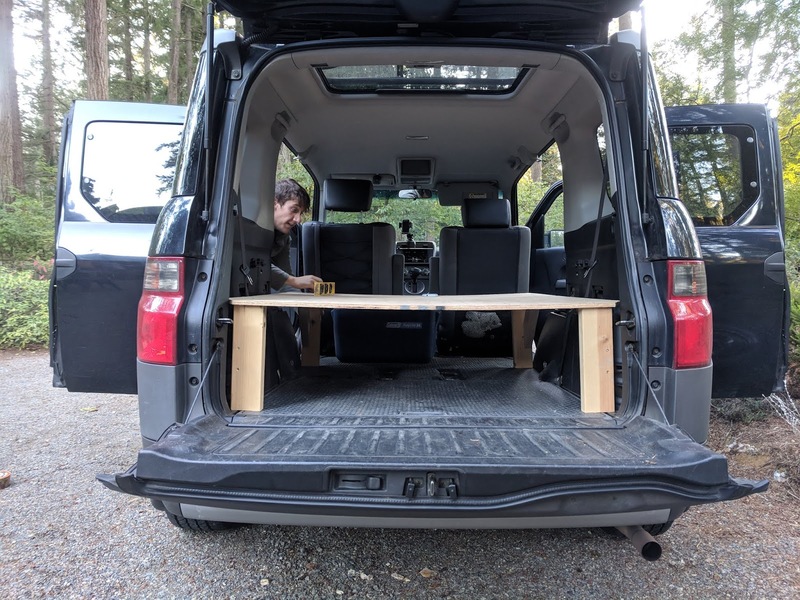 All this time, it has been our intention to remove the seats from the back of the Element and build a bed/storage system enabling us to live in the car for the whole two months, minus some stops with family. Naturally, we hadn't really put much thought into this hypothetical bed platform, and our only real concept was a vague sketch, stored in my sieve-like brain, for something that may not work at all. 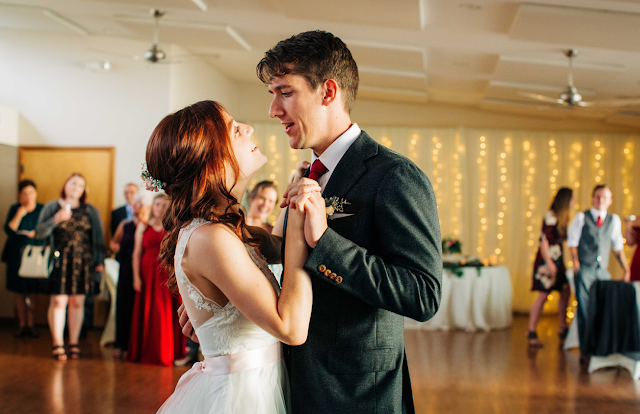 As I've frequently been taught to expect, though, things turned out alright! Thanks Universe. We started our camp system about a week before the trip, and though we are still adding tweaks, it only took us 18 hours. Not bad for two novices. Really, it was just difficult to set aside time for this endeavor while I was still at work, so construction started soon after my last day. 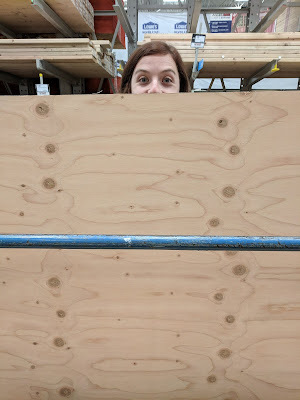 We went to Lowe's and got two 2x4s, a sheet of 1/2" plywood, seven 5" strap hinges, and two different size wood screws. Once we got to work, it was as though there was no doubt in our minds, for better or worse, about how things should be done. 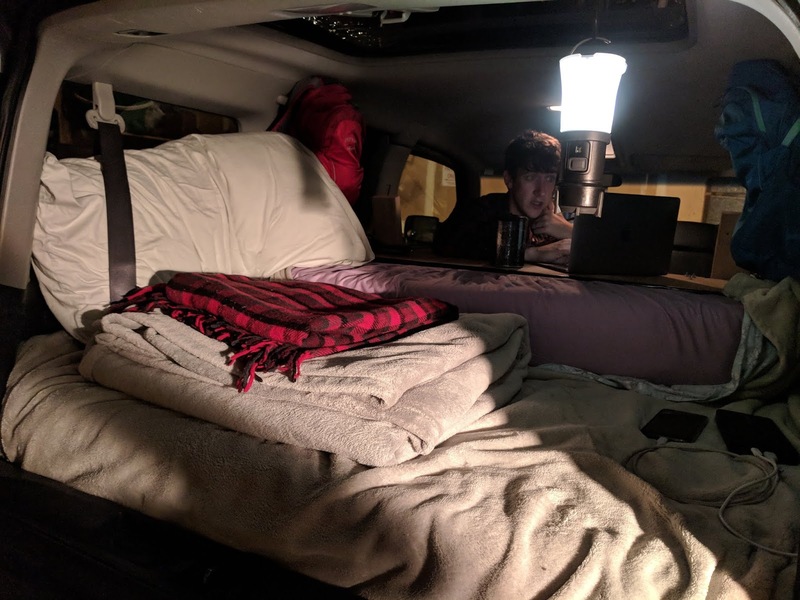 Months ago, we had ordered our 6" memory foam full size mattress, and ever since, it has been my intention to construct some sort of folding platform that would give us a table when we were hanging out in the car, and a comfortable bed when we are sleeping. 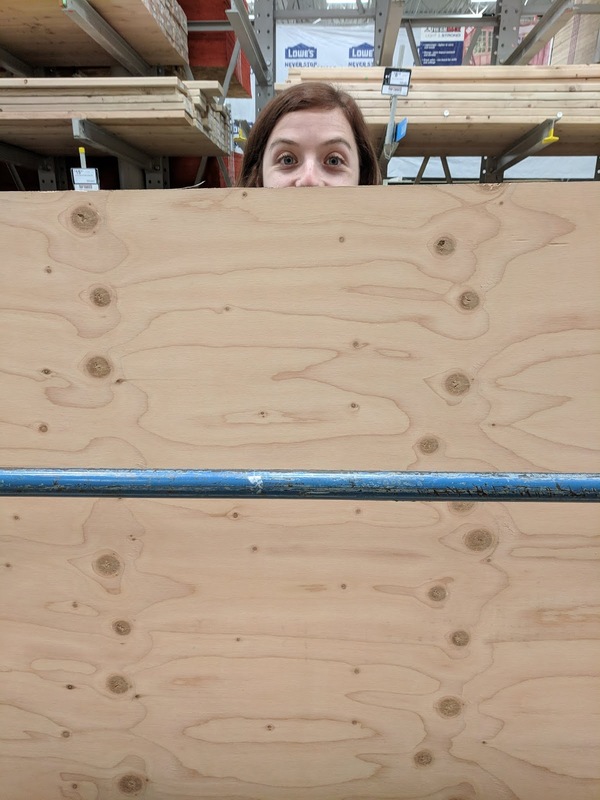 The plywood sheet was just a bit too long, so we cut off a couple inches to make it 78" long for the total platform. We then cut two 13" segments off of that. The 52" piece we were left with forms a solid base for the two folding sections, which create a small 13" table when folded up. 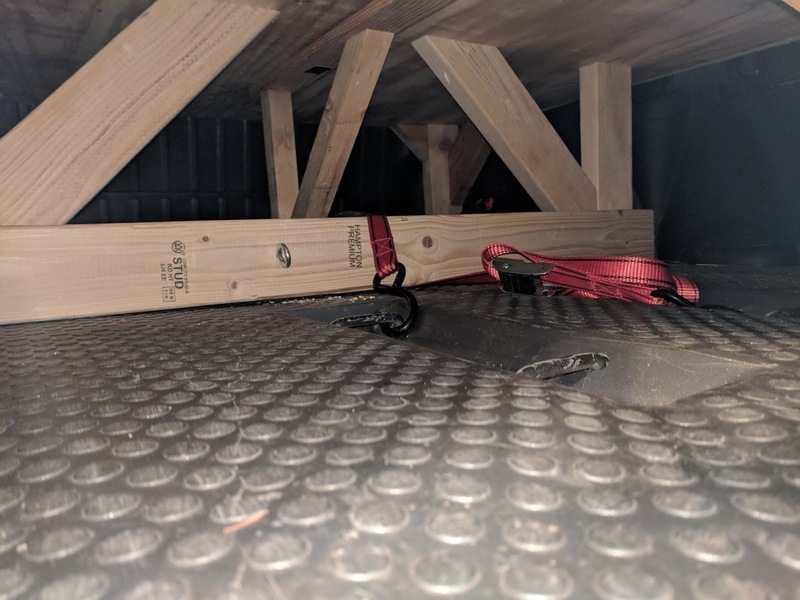 This platform is supported by six legs total, with one beam running the length of it to help stiffen, and one beam attaching the two middle legs across the width of the car. 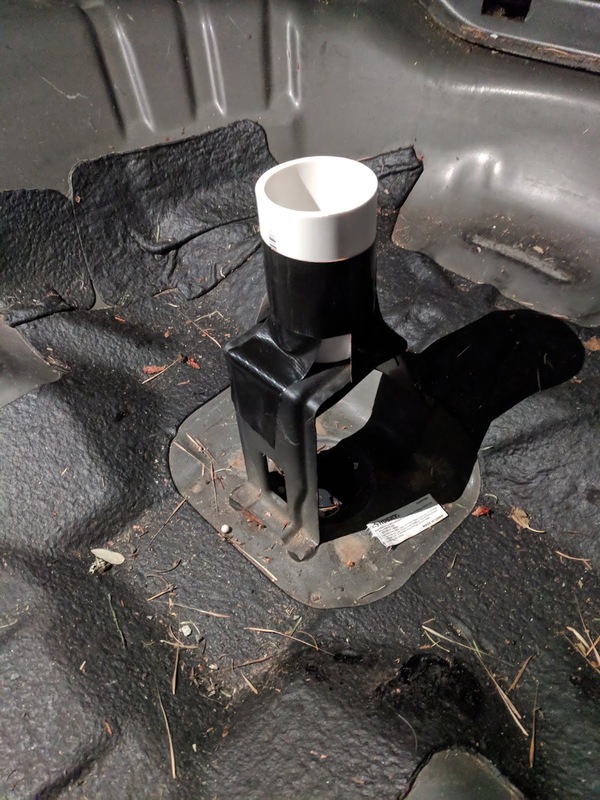 That middle beam rests on the floor of the car, and is attached to the metal seat brackets in the floor to keep it in one spot. With the middle platform constructed, we could attach the last two segments that fold. We ended up going back to Lowes for some nuts, bolts, and washers to attach the hinges to the plywood. One issue with 1/2" plywood is that there isn't much to screw into, but I wanted this thing to be light. We used two hinges for the first segment, and two hinges for the folding legs. We didn't like the two legs flopping about freely, so we put a brace between them. To help with the weakness in the middle and the outer edges, there are sections of 2x4 underneath to help support. The final segment is attached with three hinges for extra strength. Its back corners rest on two sections of 2x4 which are attached to the middle section, butting up against the legs of the main platform to keep sturdy. The very end of the whole bed rests on the backs of our two seats, which have to be all the way down and forward for the bed to be unfolded. Tie downs keep things in their place. One tie down and one bungee cord hold the platform up in the folded position. With the seats forward, there is plenty of room for us to move around. The system works, but it's not without flaw. For one, we decided that our spare tire would go on the roof of the car, without entertaining for one second that we might employ a second set of hinges to allow access to the original spare tire compartment... We may fix this somewhere along the way, bit for now we are not really suffering. This sweet top carrier cost $40 Facebook Marketplace. The issue of space has come up quite a bit. We have a lot of things with us for basic living, and the element is not really that big once you have a bed in it. We ended up finding a top carrier on Facebook Marketplace and all of our problems went away. Suddenly, we had room on the roof for all of our tools, extra bedding, a spare tire, camp fuel, and 5 gallons of gas! for meals, but not blogging.. The top carrier, all packed up! 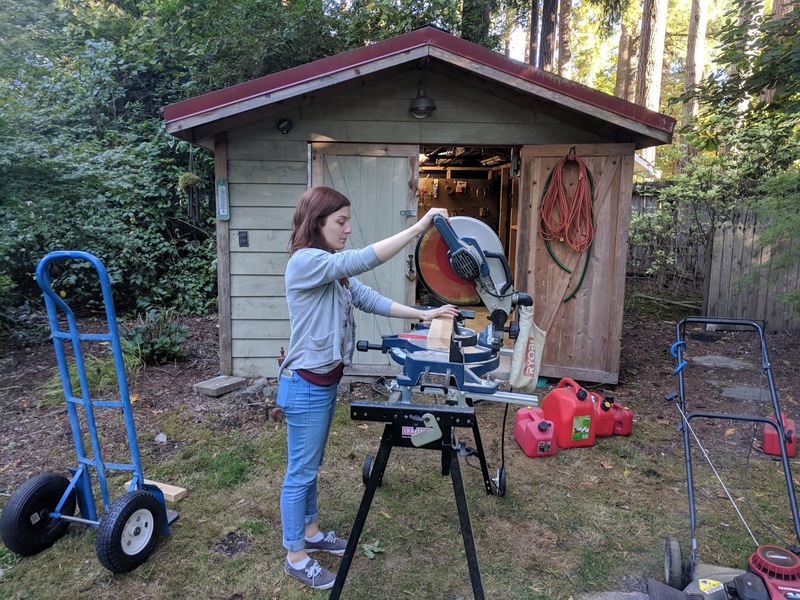 For two months, our needs are not that extreme, and though we will have some longer stays away from civilization, we are sticking to urban areas for the most part. With that in mind, we decided to stay away from more expensive battery and lighting systems. Our primary goal was to have enough rechargeable power to run our lights for a about four days. We looked at getting something like a Yeti 150, but determined that it was just a bit too pricey for our needs. 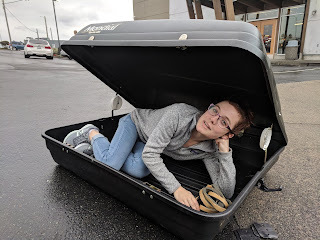 Of course, I still dream about making some sort of a solar charged lithium battery vault in the spare tire compartment, but it just wasn't reasonable for this trip. So instead we went with a RavPower 20100 that charges off of an inverter. Since all of our electronics are either USB Type-C, or micro USB, this system works well for us. 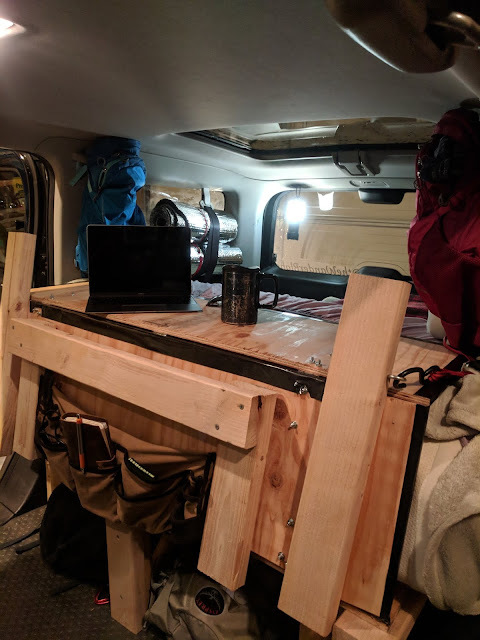 Without a doubt, this system needs some tweaking--better water storage and some sort of awning for a start--but we are on day two and still pretty pleased with how things turned out considering the time and size constraints. We always knew that living in a relatively small SUV would be difficult, but I think it was that challenge, to utilize a small space as effectively as possible, which drove us towards the Element. 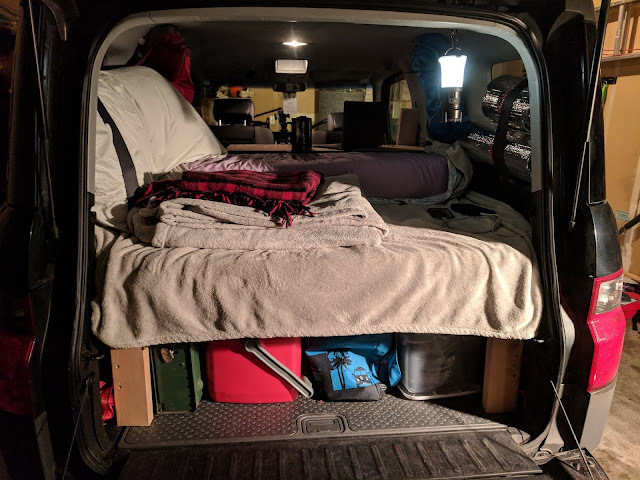 Would we like a van right now? Yeah for sure. But do we regret the Element? Not one bit. Impressive set up. You did good. That is one sweet ride. And some impressive engineering. Be sure to take tour at the end of your trip so you can do a lessons learned video. yes.....that would be an interesting thing to see.